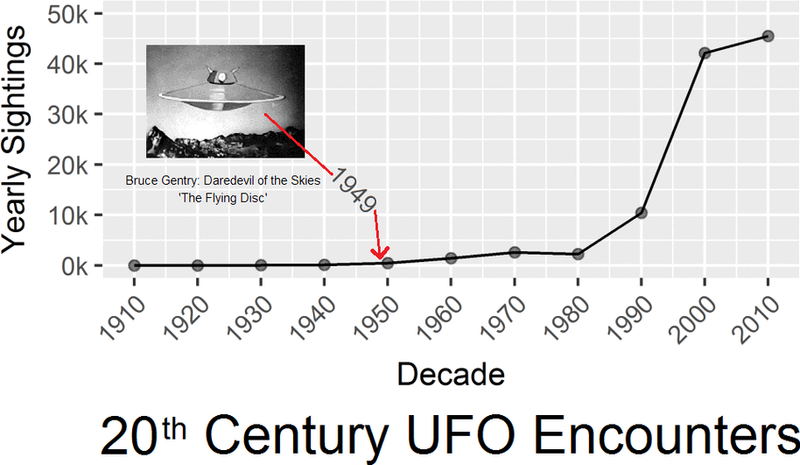 Recently, Samuel Monfort, a 4th year Doctorial Candidate at George Mason University (Human Factors & Applied Cognition) published his studies of data collected by The National UFO Reporting Center (NUFORC) of 20th Century UFO Encounters. The embellished chart below reflects the 104,947 worldwide sightings reported since 1905 [through 2010]. Interestingly, the first departure of reports less than one thousand per decade occurred approximately at the same time as what is considered to be the “first cinematic appearance of a flying saucer”. In The UFO Phenomenon: Fact, Fantasy and Disinformation, by John Michael Greer, pg. 33, author Greer wrote: ”The first movie about flying saucers was the 1949 serial Bruce Gentry: Daredevil of the Skies, in which the saucers were a secret weapon wielded by terrestrial villains…”. Subsequently, the entertainment industries, through print and moving image media, have exploited the UFO concept resulting in an exponential explosion of the parallel phenomenon of now, ’extraterrestrial’, “sightings” occurring from the middle of the last century through the present time.